In the days following the devastating Camp Fire, CAL FIRE Local 2881 members from Paradise give back to their community. Firefighter AJ Mount and his wife Melissa wanted to help those who had been displaced and lost so much. She began reaching out to her network of friends and through social media collected funds to purchase gift cards for those impacted by the Camp Fire. AJ and firefighters from Engine 82 along with Joe Rosa from Tulare FD and Joe Amador from San Diego FD took the time to pass out the gift cards at evacuation shelters throughout the area and chat with the evacuees. Many were grateful for this act of kindness and to get to talk with a few of the firefighters who jumped into action to save lives on the day that forever changed the town of Paradise. A total of $9,000 has been given to the community so far! We sat down with Pete Muñoa to learn a little more about him and his history with CAL FIRE Local 2881. Pete is the District IX Vice President. For the past two years he has been serving Sacramento, Davis and the CAL FIRE Training Center. Because it is a small district, his duties encompass both chapter and district functions. All district officers are also chapter officers. He oversees the Rank and File and Supervisor membership within the district. He is on the Supervisor negotiation team which is currently focused on the compaction caused by the current MOU with Rank and File. Pete is a member of the California Professional Firefighters Membership Activism Committee. This committee has been tasked to work on methods to maintain current, as well as recruit new union members for Locals statewide. Pete was one of the first Serious Accident Investigation Team formally trained labor representatives (now known as SART). He participated in major investigations such as the Bus Incident in Mendocino in 2001 where CDF Airtankers 87 and 92 collided over Hopland in Mendocino County killing both pilots and the Esperanza fire in October 2006 where 5 USFS firefighters were killed in a burnover in Riverside County. Pete became actively involved in the union in 1997 when he joined the Serious Accident Investigation Team as an investigator on the labor side. He ensured the accident review process was handled per policy and union employees were afforded all the legal rights of representation as well as treated fairly in the process. He was first hired in 1989 as a Firefighter I in CZU and has been a proud union member since that first day. He participated in many union coordinated efforts throughout his career but stepped up in 2009 and became a Rank and File Representative in LNU. In 2011 he received Family Liaison training, a role that he found to be of significant responsibility but very rewarding. His passion for the rights of employees prompted him to run for the position of Chapter Director for Sonoma-Lake-Napa, a role he held for three years until promoting to Sacramento as a Deputy Chief in 2014. Pete continued his union activism as the Supervisor Representative and in 2016 became the District IX Vice President. Pete feels union membership is key to the success of the employees for wages, benefits and working conditions. The union outside of CAL FIRE Local 2881 produced many successes that the nation enjoys in totality. The demise of labor groups will allow corporate greed and political influence to dictate salaries and working conditions which would be detrimental to the livelihood of our members. Being part of the union is much more than hanging a sticker in the back of your truck. Being an active participant, attending meetings, attending events and involvement with local and state elections is extremely important so we can continue to improve the wages, benefits and working conditions of our members. One of the union accomplishments that Pete is most proud of is when he took the role of family liaison for two families who lost members due to job related brain cancer. Providing that level of support for the families was "humbling but extremely gratifying" and reinforced his belief that the union was there for the membership and their families. Another is when the Battalion Chief eligibility list was going to be thrown out due to one accusation of leaked information. This happened just ahead of the 2016 fire season. The issue finally came to a head with a formal hearing at CalHR. Both Department and Local 2881 presented their sides on abolishing or keeping the list. The Union was successful in its mission which was a significant win for the membership of CAL FIRE Local 2881 and the citizens of California. Finally, in 2017, Cal Chiefs in coordination with CPF President Lou Paulson, tried to redirect monies from CAL FIRE to CalOES under false pretenses. Pete participated with a very small group of union executive officers providing factual information to legislators dispelling the mistruths being broadcast by then CPF President Lou Paulson. "This was the beginning of the end for Paulson's tenure at CPF." For the first time in history, we have a previous CAL FIRE Local 2881 executive officer (Mike Lopez) in the number two spot at CPF. Pete says pensions will be a target for politicians again in the future. There was a battle in 2014 where pension reform was high on the Governor's list which impacted the public safety retirement age and employee contribution requirements. "No one wants to see a 60 year old firefighter coming to their door when they call 911." It's not good for our members, let alone the citizens of the State of California that we serve. The recent Janus decision set all unions, including ours, back significantly. Fair share employees no longer required pay their share and are basically free loaders in our organization. "They benefit from union bargaining in wages, benefits and working conditions." It is imperative that all employees know the importance and value of union membership. "I will be an active union member until the day I die." "Stay Strong and Stay Union!" Mike Lopez & Kevin O'Meara letting the firefighters & their families know a special group has prepared a meal for them to enjoy. 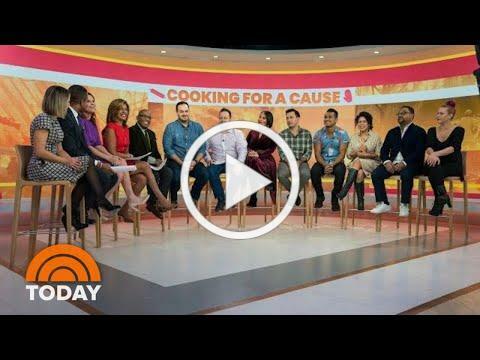 Al Roker and the chefs introducing themselves. Al Roker & Natalie Morales talking with one of the families. t-shirt line that benefits the CDF Firefighters Benevolent Foundation and our Honor Guard. Click the image below to check out the styles. These would make a great Christmas gifts! There are hoodies and even a kid's shirt too! PARADISE, Calif. - It was the best bad place. To the south was a gun shop called Fins, Fur & Feather Sports, stocked with live ammunition.To the northeast, a propane yard. Across the street, a Fastrip gas station. All around, soaring, drought-crisp pines. And in the center? About 150 terrified people who had fled the ferocious Camp f ire only to be stopped at the intersection of Skyway and Clark Road, forced to sit out the deadliest conflagration in California history. In a parking lot. Surrounded by fuel. Barred from escape by roaring fl ames and roads that were choked, first with traffic, then abandoned vehicles, and, finally, with burned-out hulks of charred metal. "Are we gonna die?" volunteer firefighter Chris Rainey was asked, over and over again. His job that day was to keep the panicky crowd as calm as possible. His response each and every time: "No, you're not gonna die." Despite its obvious downsides, he told them, the parking lot was the safest plac e to be on Nov. 8 as flames raced through Paradise with astonishing speed, taking authorities and residents by surprise, snarling roads with evacuees and killing at least 88 people. A complicated series of small decisions made by firefighters, law enforcement personnel, volunteers and evacuees themselves saved the people in the parking lot and hundreds of others - men, women and children who could not leav e their burning neighborhoods and had to do what no one wants to do in a disaster. Calin Moldovan, an engineer with the California Department of Forestry and Fire Protection, had just started an 11-day vacation at his home in a Sacramento suburb when he awoke to a text message from his captain in Magalia, population 11,000 or so, tucked on a ridge in the Sierra Nevada north of Paradise. The message bore a single image: a giant, billowing column of smoke. How bad? Moldovan texted back. MOLINE, Illinois - When disaster strikes, first responders are always the go to help. Those day to day calls can take a toll. The U.S National Library of Medicine indicates regular exposure to traumatic experiences might put firefighters at a higher risk of PTSD.There is help for them in the Quad Cities. Local 4 News spoke to local firefighters to get a deeper look into their day-to-day lives. "I started off- more so i wanted to go into law enforcement i figured that kinda wasn't for me and then go into the paramedic and fire side a few years ago and realized this is it," says fireman and paramedic Jacob Mussman. Like a lot of other firemen, Mussmann took the job with the desire to help others. Long days, a lot of runs, sleepless nights, several shifts in a row. It's not surprising that coffee is a staple at firehouses across the country. Increasingly, firefighters also are consuming energy drinks to get the extra boost they need to make it through their shifts. While sales of soda are sliding due to health concerns and a struggling economy, the rate of sales for energy drinks are steadily growing. Redbull and Monster have long dominated the energy drink market and sell a combined $8 billion worth of product annually. The topic of energy drinks has been receiving some increased scrutiny in the fire service after the June 10, 2017, collapse of a Kansas City firefighter during a routine training on a warm day. He ended up in a week-long coma due to heat stroke. According to his cardiologist, the firefighter's use of energy drinks may have contributed to the severity of the event due to the diuretic effect of caffeine contained in the drinks. It's not the flames or even the smoke. It's the toxins that escape during a fire that are causing high cancer rates among the nation's firefighters. In the new film " Only the Brave," 19 members of the elite Granite Mountain Hotshots, a skilled team of firefighters from Arizona, die when a bolt of lightning ignites a fire and entraps the men. The real-life deaths of these men, who've been called the Navy SEALs of firefighting, is how many people still think most firefighters die. But a surplus of new evidence shows that it's not just the flames themselves or the inhalation of smoke that's taking our firefighters in historically large numbers. THE NEW AND IMPROVED CAL FIRE MUSEUM WEBSITE IS UP AND RUNNING! HEAD OVER AND CHECK IT OUT. JERRY AND THE TEAM WORKED HARD ON THIS PROJECT. GREAT JOB!